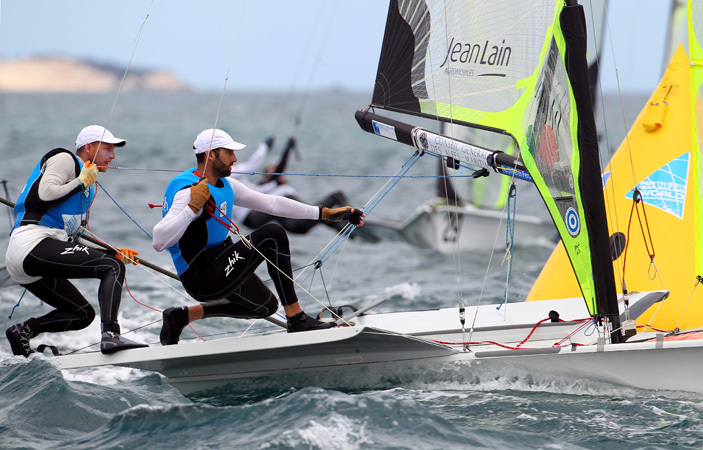 With three days of medal racing ahead, competition at the ISAF Worlds saw the finalists heading into the battle for gold in Women’s Match Racing Friday and the top competitors in the Gold fleets jockeying for one of the ten positions in the coming medal races. In light to moderate south easterly breezes, the 49ers completed one Gold fleet race to be on schedule for Sunday’s medal race, the Lasers completed two races that further consolidated the top ten and a break away leader emerged in the Men’s RS:X. The Women’s 470s and Stars enjoyed a lay day. 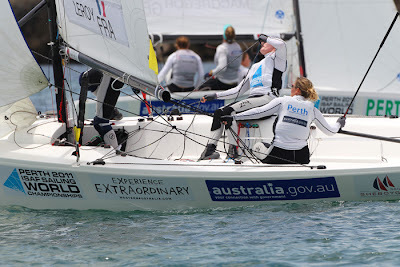 Anna Tunnicliffe (USA) and Lucy Macgregor (GBR) will face off for the gold medal in the Women’s Match Racing final on Friday, December 16, after some exciting sailing wrapped up the semi-finals on Day 13 of the Perth 2011 ISAF Sailing World Championships. And that was proved in Macgregor’s semi against Claire Leroy (FRA), who was the early leader. “We were down two-nil, but we were feeling confident and strong as a team, which really helped us to pick it up,” Macgregor said on her comeback to win the last three matches. 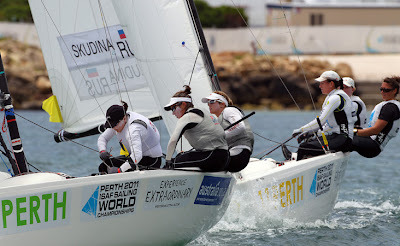 Sailing for the bronze medal will be Russia’s Ekaterina Skudina and Leroy.The semi-finals were moved out of the Fremantle Inner Harbour to the Centre Course because of continuing south-easterly winds which make for tight and difficult racing in the working port. The open water racing still gave spectators a close-up view from the Bathers Bay grandstand. 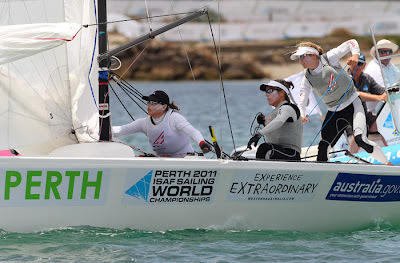 The first semi final on Thursday saw Leroy match up against Macgregor, with the second semi between Skudina and Tunnicliffe. 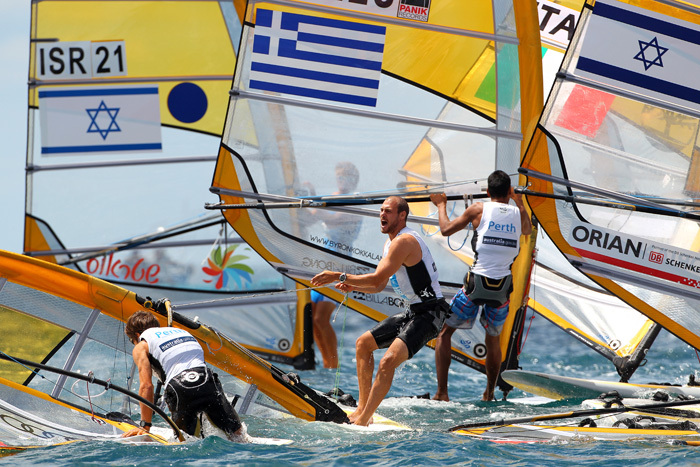 Each team needed three wins to advance through to the Gold Medal Race on Friday, ensuring racing was very close all day. 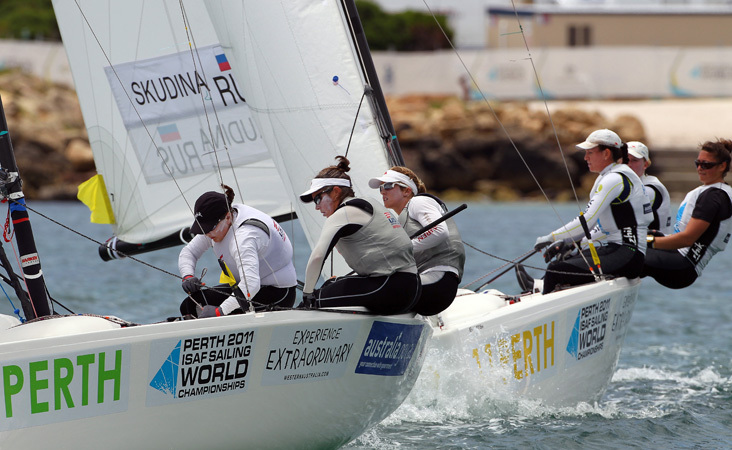 After the first two flights of the day, Tunnicliffe and Leroy were sitting on two wins apiece, making flight 103 the ‘must win’ matches for Macgregor and Skudina. In what was dubbed the ‘cold war race’ by the commentators, Skudina managed to get the lead on Tunnicliffe and cross the line in front. Macgregor also got over the line in her match against Leroy, much to the delight of the British fans watching in the grandstand. “We’re feeling really pleased and really good about our results today. 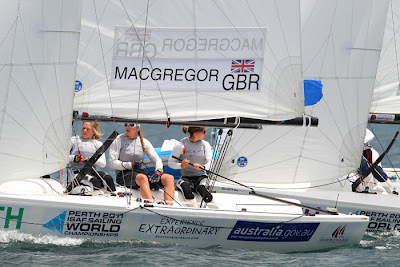 We’ve had a lot of support from family back home and from the supporters cheering us on from the rocks,” Macgregor said. 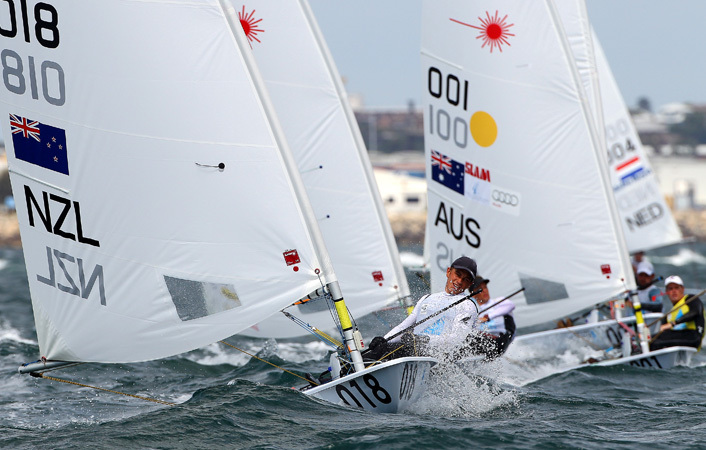 With a penalty on Skudina, flight 104 was the deciding win for Tunnicliffe to go into the gold match. 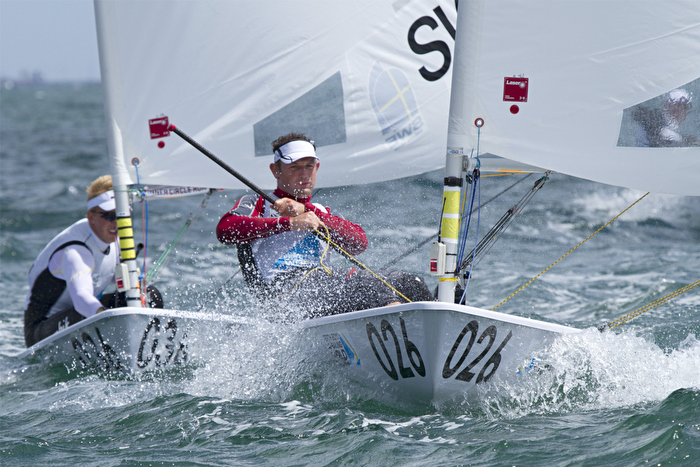 Macgregor evened the score in the same flight, forcing a final and decisive match with Leroy. 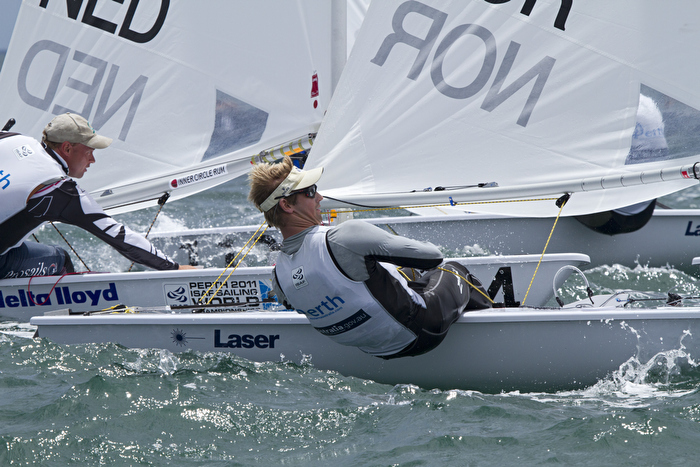 It proved to be a tough one, with Macgregor forcing a penalty on Leroy in the pre-start. 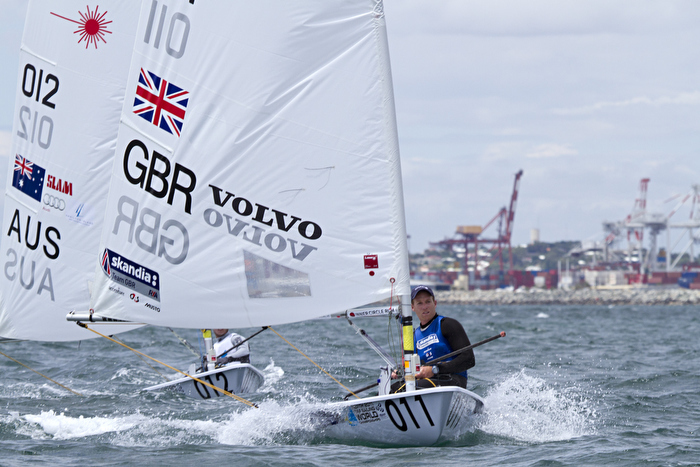 They were neck-and-neck for most of the race but in the last downwind leg, Macgregor managed to extend out to a three boat lead and win the race, securing her spot against Tunnicliffe for the gold medal on Friday. 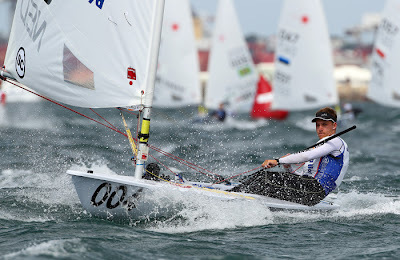 Races were also held to determine the fifth to eighth placings, which left Australia’s Nicky Souter in fifth place, Sweden’s Anna Kjellberg sixth, followed by Netherland’s Mandy Mulder seventh and Australia’s Olivia Price in eighth spot. 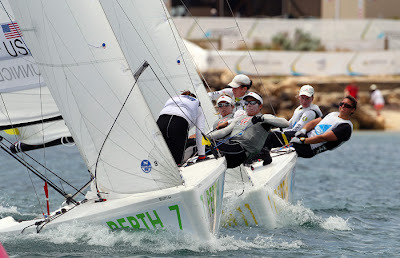 The Women’s Match Racing final is schedule for 1400 local time on Friday 16 December. Racing will be on Inner Harbour Course but will be moved to the Centre Course if weather conditions are unsuitable in the harbour. 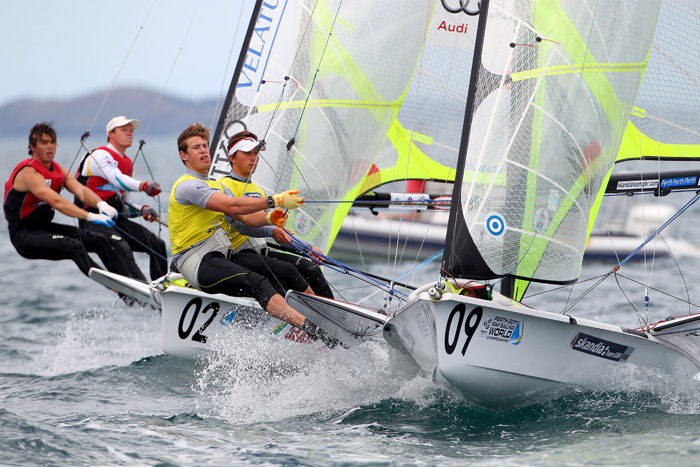 Model of consistency Tom Slingsby (AUS) continues to hog the limelight of Laser sailing at the ISAF Worlds with his fifth victory and a fighting fifth place to be 11 points clear of his nearest rival. He leads Great Britain’s Paul Goodison (27) and Nick Thompson (33), followed by Australian Ashley Brunning (35), Germany’s Simon Groteluschen (36) and Sweden’s Johan Wigforss (39). The Laser fleets at Perth 2011 have a reserve day on Friday, 16 December, before returning for the ninth and 10th races on Saturday with the Medal Race on Sunday.Slingsby, who had a seven-point lead at the start of the day, had a vice-like grip on race 7, going 26 seconds ahead at the second mark, only to see it slip to five at the third. He finished 1 minute 16 seconds clear. In the eighth race, Slingsby had to bide his time and produce excellent downwind efforts to pick up valuable positions, finally crossing in fifth. “It was another good day for me. The first was a nice race and I managed to hold it. In the second I was doing well on the first beat and there was a big right-hand shift and I rounded the mark 20th. I managed to come back and I was happy to come fifth. On what he needs to do on Saturday in races nine and 10, he said: “It will be one more day of tricky Gold fleet sailing close to shore (Bathers Bay). I just need one good one on Saturday. I just have to keep myself clear and sail my own race. Up front would be preferable,” he said. 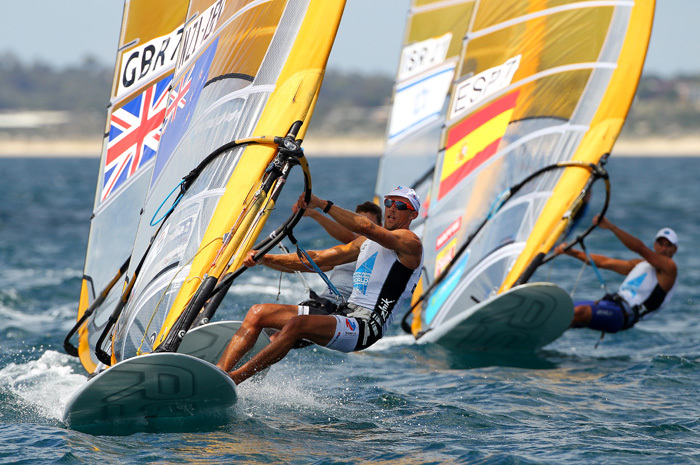 Fellow Australian Ashley Brunning made his charge coming in from the left side on the second upwind leg and maintained second position until Great Britain’s Paul Goodison overtook him on the final downwind leg to finish behind Slingsby. “It was pretty wild and crazy out there.The conditions were so crazy with big gaps and everyone came together so it was hard to be consistent.” Goodison said about today's race. 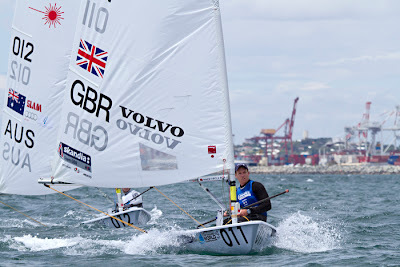 It was Great Britain’s world number two Nick Thompson who fended off all challengers for most of race 8, especially in the final upwind leg where up to 15 sailors were within 100m at one stage in the fluky winds. “It was pretty tough at the start and I went right and got the first shift. On the last beat there were two winds, either side and you had to choose which one to go with to cover both sides. That’s been the nature of the winds the past few days, choosing between two breezes.” Thompson said. 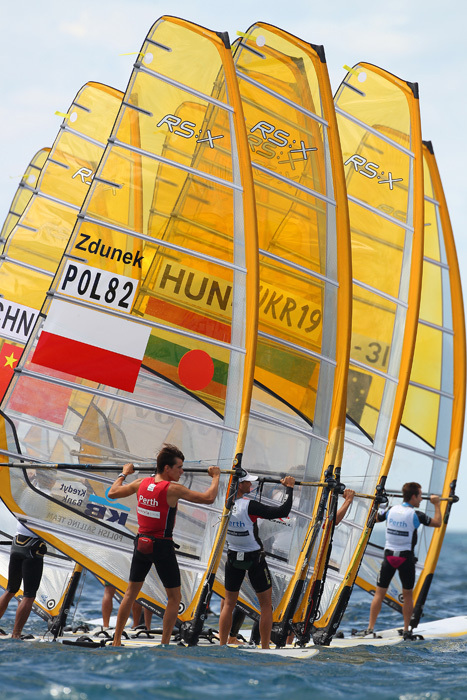 While the front-runners are jockeying for the medal dais, a large group of sailors is shuffling the deck to see who gets a top-10 position after the last two Gold fleet races. On the cusp are Tonci Stipanovic (9th), Frenchman Jean Baptiste Bernaz (10th), Cypriot Pavlos Kontides (11th) and Australian Tom Burton (12th). The Lasers will enjoy a reserve day on Friday 16 December. John Pink and Rick Peacock of Great Britain have retained their overall lead after Thursday’s only race for the 49ers at the ISAF Worlds, with the competition now split into Gold, Silver, and Bronze fleets. 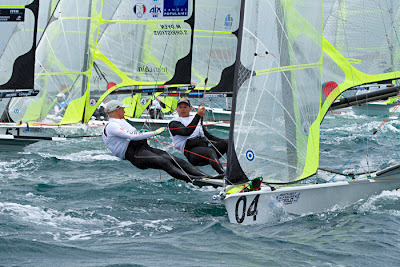 Emil Toft Nielsen and Simon Toft Nielsen (DEN) continue to hold second place, one point ahead of Australian pair Nathan Outteridge and Iain Jensen. The Australians share their position on points with Peter Burling and Blair Tuke (NZL). Pink and Peacock finished in second place in the Gold fleet race on Thursday, but managed to make up some ground to challenge the race winners, the Toft Nielsen brothers, on the final leg. After the race, Pink said: "We were just trying to stick to our strategy and from the start they got a little bit ahead. We caught back up at the last top mark but they kept it together and obviously did the right things. We did exactly the same almost down the last run but they just stayed ahead, but it was close." The Toft Nielsen brothers took out the race by only seven seconds. 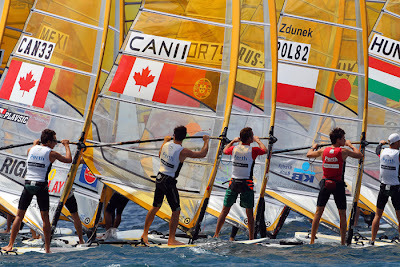 Thursday’s Silver fleet race was won by Austria’s Thomas Zajac and Thomas Czajka, while Andre Otoo da Fonseca and Marco Soffiatti Grael (BRA) took out the Bronze fleet race. The 49er Gold fleet is scheduled for three races on the Centre course from 0900 local time on Friday, 16 December. Dorian van Rijsselberghe (NED) has broken away from Nimrod Mashich (ISR) in the Men’s RS:X Gold fleet after Day 13 of competition at the ISAF Worlds, placing himself firmly in a winning position. Van Rijsselberghe said there was a lot happening on the water on Thursday, 15 December. “It was all really close. Every time – right up until the finish, it was up for grabs. 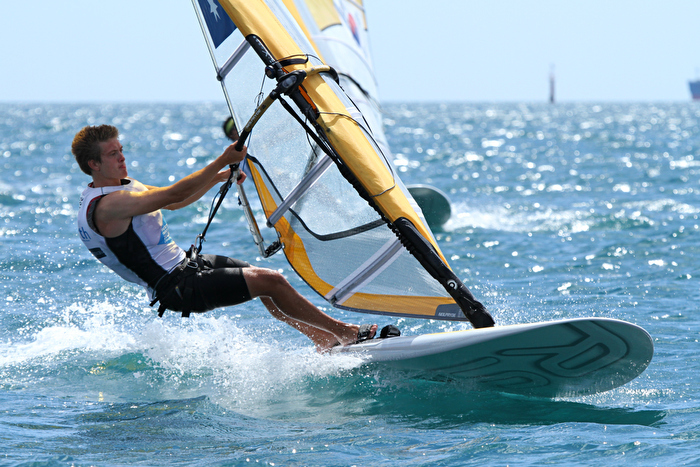 It was exciting racing and was good for me not to make any shockers,” he said. Van Rijsselberghe was never far from the front of the pack in race 6, finishing with a 23 second lead over Joao Rodrigues (POR). Paul Tobin (NZL) finished in third place. 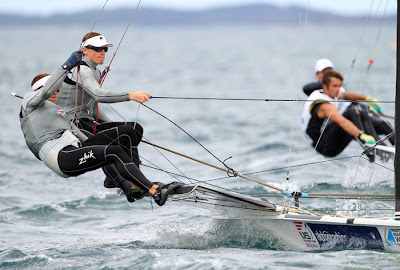 After a general recall, race 7 was abandoned due to wind shift. When it finally did start, the fleet split evenly, with van Rijsselberghe again taking the lead. He was unable to hold this position as Przemyslaw Miarczynski (POL) powered through to take first, closely followed by world number one Piotr Myszka (POL), with third place going to Byron Kokkalaniis (GRE). Race 8 was a catch-up because of an early end to racing on Wednesday, but Kokkalaniis (GRE) took a sizeable lead over his nearest competitors. 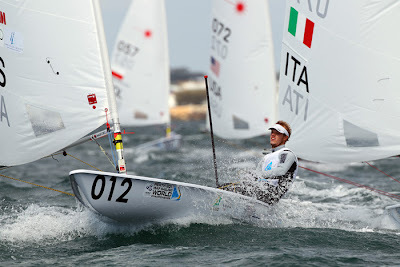 “I had a really good start (for Race 8), had really good winds, and was the first to cross mark one. And bam that was it,” Kokkalaniis said. Second place recipient Tobin (NZL) followed him over the line 20 seconds later and third went to fleet overall number one, van Rijsselberghe. World number one Myszka (POL), who finished 12th in race 8 and is second overall, said with two more races, anything is possible. “I will try to beat Dorian. I can find a solution for that. I will fight for sure, I think everything will be okay,” he said. Men's RS:X have a scheduled rest day tomorrow. Tomorrow’s action will see the Women's 470 and Star classes back on the water on with the Women's 470 scheduled to race on Centre Course from 1300 and the Stars on Leighton Course from 1300 local Perth time.